HR technology, when applied well, has the potential to make a positive difference in the lives of employees and improve organisational results. Lori Block, an expert in Communication and Technology, looks at a global approach to defining an HR technology strategy for the future. There may be nothing more powerful and effective at portraying and positioning the organisation’s commitment to its people than HR technology— through its wellness programmes, services, total rewards strategy and programmes, organisational culture and approach to employee engagement. But when HR comes to making the business case for acquiring new technology, things get tough: evaluating vendors, costing out solutions, estimating disruptions during implementation, determining how current and new systems will talk to each other. When you add to that trying to get reliable numbers to figure out what Finance always needs to know – the return on this investment – it’s understandable why a strong vision, or a strong action plan, or both, get lost along the way. Our own experience has consistently shown the value of taking a step back to validate the objectives and business imperatives behind adopting this or that solution. And if the technology is employee-facing, you need to know what behaviours are important to drive and, the full scope of what needs to be done. You also need to evaluate priorities, and identify how various activities impact one another. Making an initial investment to “get your ducks in a row” has a significant impact on the overall effectiveness of any technology changes and the firm’s ability to achieve its long-term goals, using technology as an enabler. This important first stage is what we call Phase Zero. It comprises four steps and results in a true business justification for the project, as well as a compelling vision and achievable action plan. A confirmation of your ultimate service – and information – delivery mode. A high-level analysis of your current technology environment, identifying what data and administrative tools are currently in place for employees. A high-level phased implementation plan. A high-level proposed navigation schema. Business justification for the impending initiative. Simply documenting the desired outcomes and corresponding success measures that will be employed to determine whether those outcomes are achieved often is enough. Increase the credibility of your HR programmes? Enhance the health status of your employees? 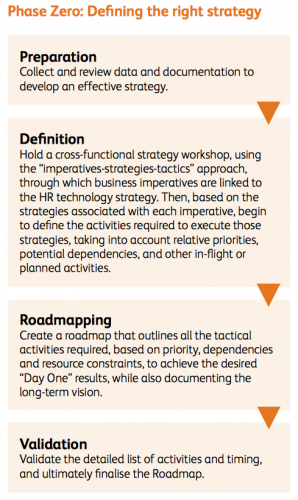 Align programmes with organisational strategy and operational goals? Reduce costs and increase efficiency? Regardless what it is being applied to, Phase Zero helps ensure that the needs and wants of the end user are addressed right from the start.